Camarillo Springs Golf Course opened in 1972. It was purchased by Chameleon Springs LLC in 2015 for $4.3 million. In October 2016, Mr. Richards notified homeowners by letter of the possible impending closure. Declining play, rundown condition, and not financially viable were given as reasons for closing the course. The Camarillo City manager was having discussions with the owner about his plans for the course. Currently the property is zoned “Open Space”, which would allow for three homes to be built on the three parcels. A change would also require a general plan amendment. In February, 2017, the City Council denied a general plan amendment referred by New Urban West, Inc. (NUWI) on behalf of Chameleon Springs LLC. It was denied on the basis that it was very light on details of just what would be built in place of the course. In July, 2017, The Camarilo Springs Golf Club Development Community Advisory & Communication Committee (CSGCDCACC)presented a 16 page brochure that described the proposed development and outlined who made up the committee and how the development plan was developed. 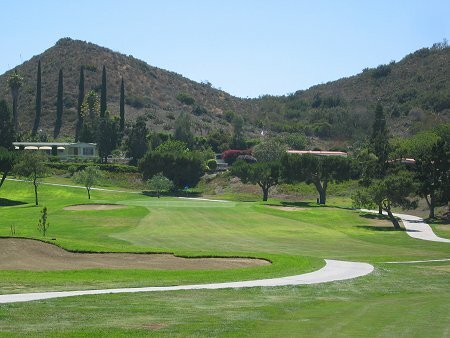 The full color professionally done brochure can be seen at PreserveCamarilloSpringsGolf.org. However, the economic future of the golf course itself was not guaranteed, nor was the golf course to remain 18 holes. The prospect of a nine or 12 hole course was mentioned. On September 1, 2017, NUWI filed a request for a General Plan Amendment for the golf course property. October 6, 2017, dozens of local residents spoke in favor of the development proposal presented by NUWI. The golf course property lies in a flood plain, so the developer has to convince federal, county, and city officials that their proposed development can be protected from flooding. The City Council voted 4 – 1 to allow NUWI to prepare studies in that regard. Preliminary mitigation efforts presented by NUWI include raising the land on which homes would be built and constructing a dirt berm 20 to 30 feet wide and ten feet high to block Conejo Creek from spilling onto the property. They also suggested putting in a multi-million-dollar pipe system to carry much of the water out of the area. In December, 2014, Camarillo Springs was the victim of massive mud and rock slides that destroyed dozens of homes. By all indications, the golf course remains open for business today.